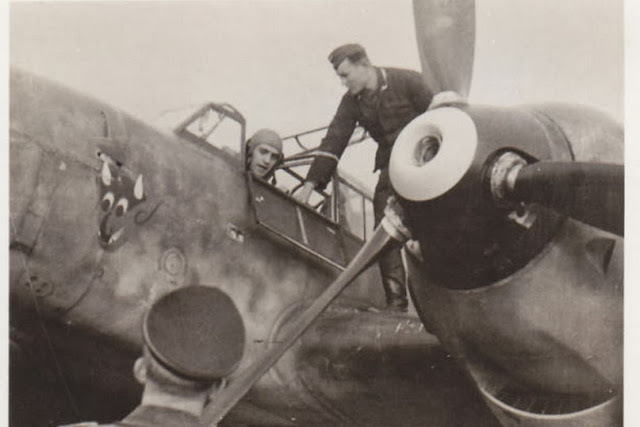 Above; Bf 110 "L2+FR" of 7. (F)/LG 2 photgraphed under camo netting in the Brussels region - probably Grimbergen - during the Battle of Britain. 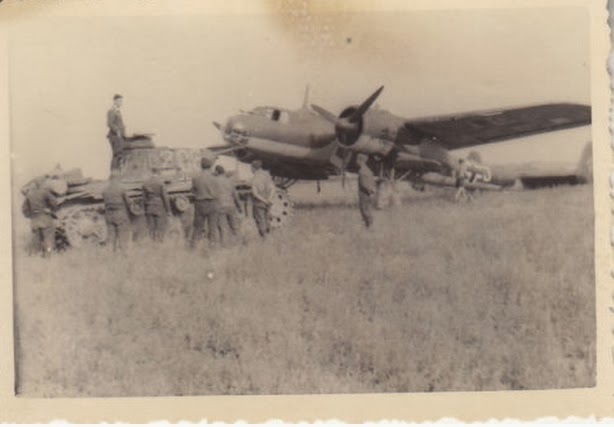 This machine is probably Bf 110 C-5 WNr 2188, which was lost on 2 October 1940 in collision with WNr 2263. 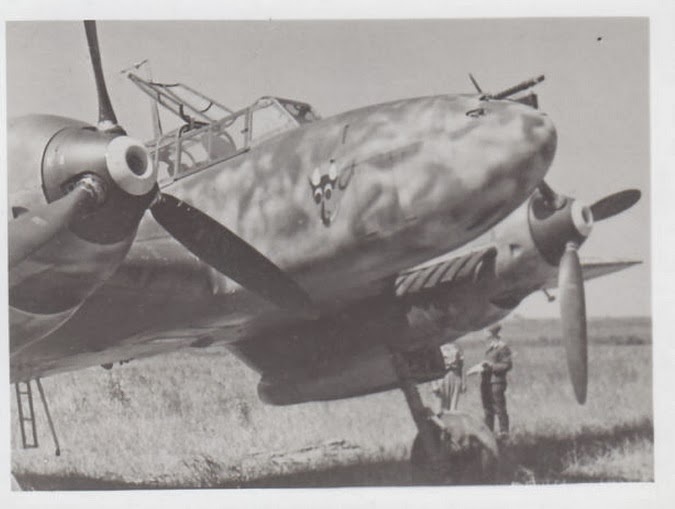 Below; a Bf 110 E on the Russian Front, summer 1941. While some of the lightly armed 'C' variants on the strength of 7./ LG 2 dispensed with forward firing armament, the E-sub-type claimed over thirty aerial victories with the recce Staffel up to March 1942. Lehrgeschwader 2 is a relatively unknown Luftwaffe unit. 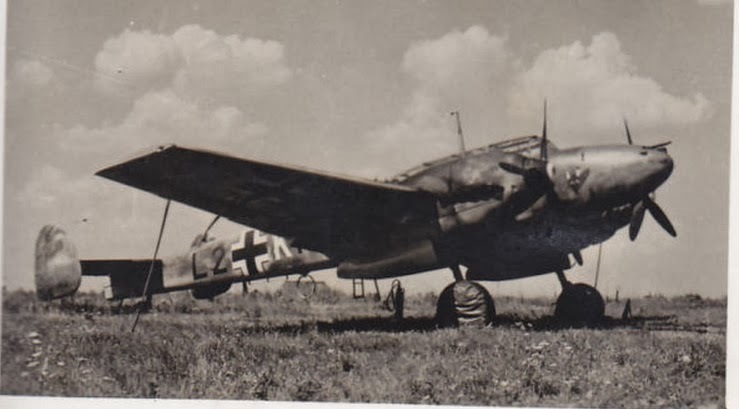 While its sister unit LG 1 is reasonably well known as a bomber unit - the only Luftwaffe bomber Geschwader to have flown combat sorties from 3 September 1939 (Poland) to May 1945 (Oder Bridges) - LG 2 was a bit of a hybrid, established during 1939 and disappearing at the end of 1942, its various Gruppen and Staffeln operating independently and in different theatres and eventually being absorbed into larger formations. I./ LG 2 operated as an independent fighter Gruppe during 1940 before being attached to JG 77 and becoming I./ JG 77 in January 1942. 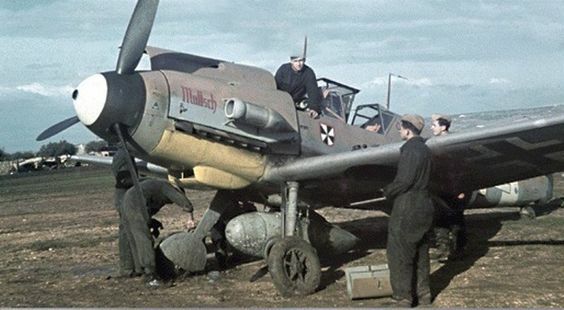 II./ LG 2 was a Hs 123-equipped ground attack formation, prior to converting to the Bf 109 E and being re-designated I./Schlachtgeschwader 1 during the winter of 1941/42. III./ LG 2 was mostly turned over to long-range reconnaissance (although 10./ LG 2 was a seaplane unit before re-equipping with the Hs 123 and 11./LG 2 a night fighter Staffel ). One of the component recce Staffeln of III./ LG 2 was 7. (F)/LG 2 which was established prior to the outbreak of WW II and flew the Do 17 P, standard equipment for a long-range recce Staffel ('F' for 'fern', lit. 'distant' or 'long-range' ). First Staffelkapitän was a Hptm Gerndt and as several personnel assigned to this unit had fought in Spain, the laughing devil's head - the emblem of the recce component of the Legion Condor - was quickly adopted as the Staffel emblem. 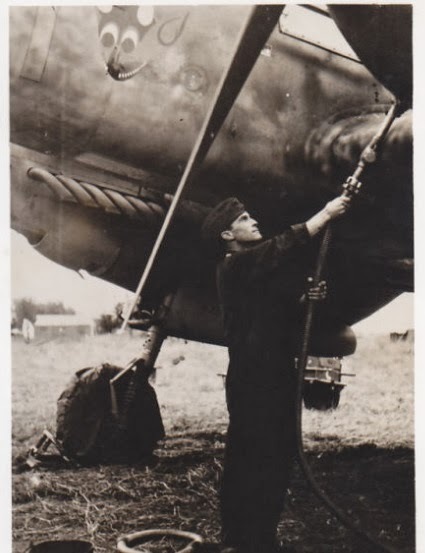 The twelve Do 17 Ps of 7./ LG 2 were based in Deckenpfronn for the Polish campaign and flying at high altitude deep into Poland no losses to enemy fighters or anti-aircraft fire were recorded. Shifting westwards the Staffel appears to have been based in Muenster-Hansdorf for the Westfeldzug (campaign in the West) but already during this period elements of the Gruppe were being absorbed into other formations - the Stab/LG 2 becoming the Stab/StG 1 while 8./LG 2 was re-designated 3. Fern.Aufkl.Gr.Ob.d.L. 7./LG 2 reported one loss during the Phoney War, a Do 17 P lost following engine failure on 3 March 1940. Above; Dornier Do 17 P "L2+BR" of 7/. (F)/LG 2, spring 1940. Three aircraft were lost over France during 'Fall Gelb' including a Do 17 P brought down by a Spitfire on 28 May 1940 almost certainly during the course of a sortie over the BEF evacuation beaches between Dunkerque and La Panne. The three crew were injured in the resulting belly-landing at Dixmude. A Spanish veteran, Uffz. Pinske, and his crew were shot down on 4 June, the pilot- who was injured - carrying out a successful emergency landing at Voyenne. At the conclusion of the campaign in France 7./ LG 2 moved back to Karlsruhe and re-equipped with the Bf 110 C-5, a more modern and much faster aircraft. One of the pilots arriving at the unit during this period was Leutnant Robert Kneifel, an Austrian born in 1913 in Bergerac (south-west France - his father, a French teacher, was on an exchange year abroad and married a local French girl, prior to being interned during WWI.. ). A selection of his photos - along with those of another 7./ LG 2 veteran ex-Ofw. Otto Stahleber - illustrate a two-part article on 7./ LG 2 published in 'Avions' magazine (September/October 2003, Lela Presse) compiled by Charles Aubusson. 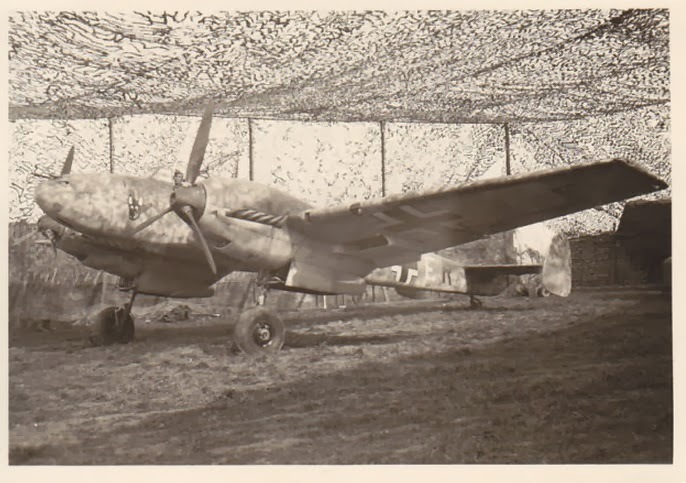 Below; Staffelkapitän 7./ LG 2 Hptm Gerndt on the wing of this B 110 C under camo netting evidently overseeing pre-flight preparations. The Bf 110 C-5s of 7./ LG 2 were lightly armed and fast, retaining only the rearward firing MG and carrying extra fuel and photographic equipment. The Staffel departed Germany for Belgium on 10 August 1940 being based principally at Grimbergen to the north of Brussels -sharing the facilities with the Do 17s of Wekusta 26 - and Evere/Melsbroeck with sorties being flown over the UK almost immediately; a Bf 110 C-5 of the Staffel was forced to carry out an emergency landing at Wissant on the Channel coast on 13 August while five days later the Bf 110 C-5 flown by Oblt. Werdin was shot down after being caught by five 54 Squadron Spitfires up from Manston, the aircraft going down in the Channel. Above; Oblt. 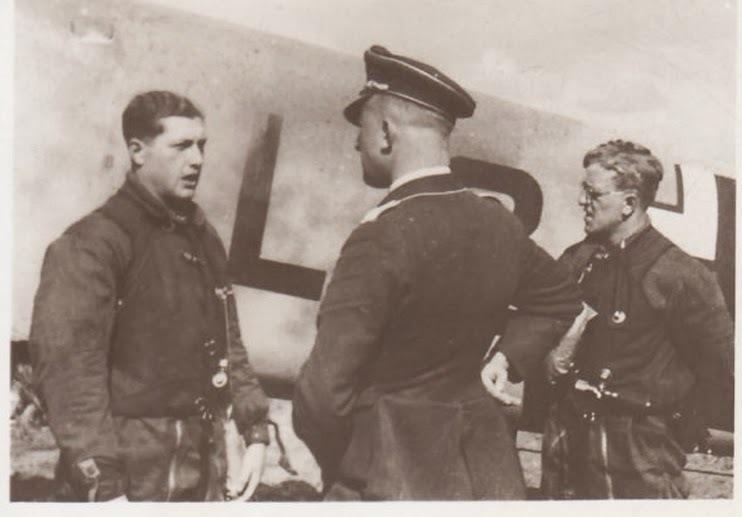 Josef Peteani (left, note spelling) reporting to the Staffelkapitän 7./ LG 2 Hptm Gerndt (back to camera) on his return from a sortie over England during the Battle of Britain. On 25 September 1940 Bf 110 C-5 " L2+ER" flown by Oblt Weyergang was dispatched to photograph targets in London but ran into a 229 Sqn Hurricane and in the ensuing pursuit took a number of hits before crashing north of Hastings where the two crew were buried. On 2 October Ofw. 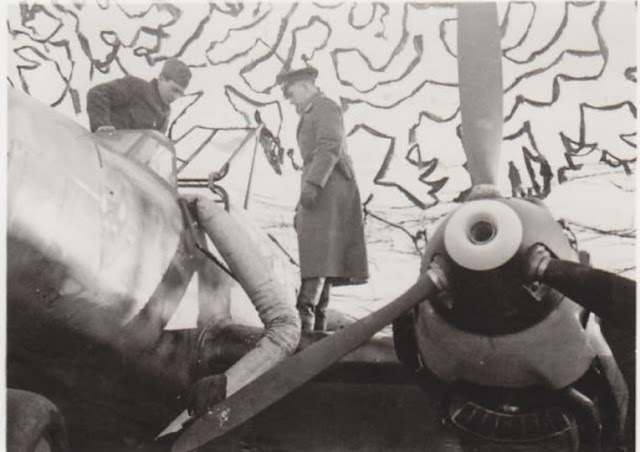 Hermann Kroll was airborne from Grimbergen on a test flight but collided with another 7. Staffel Bf 110 flown by the crew of Oblt. Eckert and his radio operator Uffz. August Haas. All three airmen were able to bail out but Eckert and Haas were too low for their chutes to deploy correctly. Kroll was not held to be responsible for the accident and would later be awarded the Ritterkreuz for his recce flying in Russia. Another notable and much photographed loss during the Battle of Britain was that of Oblt. Roland Simmerich (radio operator/gunner Uffz. Rudolf Ebeling) brought down by RAF fighters on 20 October 1940 at the controls of Bf 110 C-5 "L2+MR" (WNr. 2228) at Bockingfold near Tunbridge Wells, Kent. 7./ LG 2 lost a fifth aircraft over Britain on 21 December 1940 - Lt. Helmut Fischer at the controls of 'L2+ER' was caught by fighters of 64 and 611 Squadrons over the Thames estuary. The rear gunner Uffz. Kurt Schäfer was killed early on in the encounter, but Fischer dove away steeply westwards and managed to crash-land his machine at Mardyck on the Channel coast. The hapless Schäfer bled to death in his compartment- his body riddled with 32 rounds. Having lost nearly 50% of its complement of aircraft during the period of the Battle of Britain, the Staffel moved back to Austria to winter in Wiener Neustadt, where a number of brand-new E-2s, E-3s and E-6s were taken on charge. 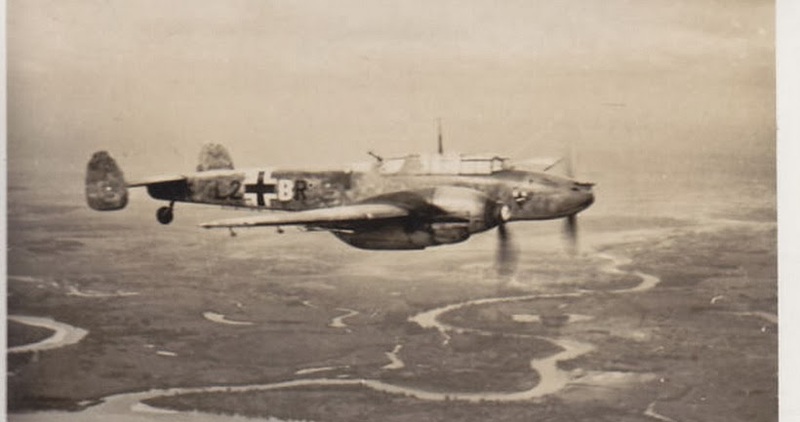 The Bf 110 'E' sub-type featured up-rated DB 601 N engines while the E-2 and E-6 sub-types could carry bombs and were thus intended to fill a much more offensive role with the invasion of Russia then in the planning stages. It was at this point that Gerndt left the Staffel replaced by another Spanish veteran as Kapitän, Hptm Hans Schäfer. 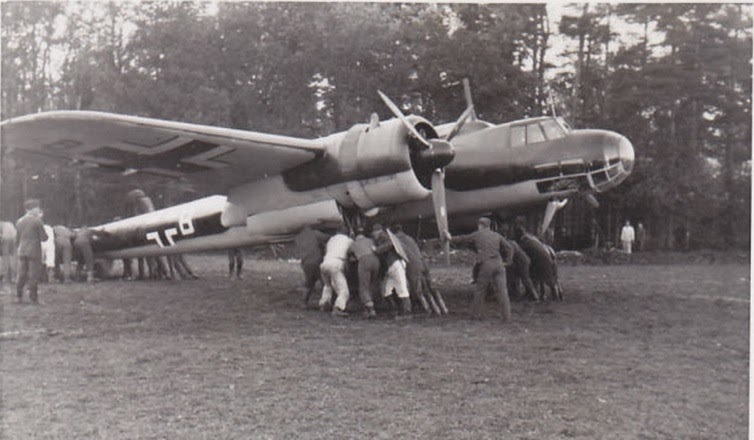 Prior to Barbarossa however, the Staffel was deployed to the Balkans..
Below; preparations for a sortie probably prior to the Balkans campaign, 7./ LG 2 being based at Vrazdebna, near Sofia, Bulgaria. On 10 April 1941 the Staffel lost two Bf 110s and three crew killed ( C-5 WNr. 2293 and an E-3 WNr. 2318) in poor weather conditions over Bulgaria. Below; summer 1941 over Russia, "L2+BR" seen in flight over the Krimentschuk sector. To be continued.